A legal assistant is also often called Paralegal professional. As a legal assistant you will be asked to assist the supervising lawyers in every way possible. Though you belong to the law fraternity, but you cannot advise the clients. The lawyer will depend upon you to perform certain crucial tasks such as drafting the contracts and preparing other key legal documents. Often the paralegal is given the task to research a case and support the arguments made by supervising lawyer in the role of prosecution or defense. Other smaller tasks that a legal assistant may have to perform can be faxing and filling documents. In the latest survey it was found that the average salary of a legal assistant was nearly $54,000 per annum. 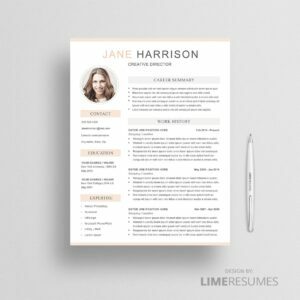 If you want a high paying job as a legal assistant then you will have to submit a perfect legal assistant resume by professional resume service. To apply for a paralegal job you should have a Bachelor’s or Associate degree in Paralegal Studies. How to Write Legal Assistant Resume Objective? Legal assistants are those professionals behind the scene supporting the success of a case. Their research and documentation skills equip the lawyers with the due force in arguments. Legal assistants have to go through various confidential which, other than the client and supervising lawyer, no one knows. It is a skill for the legal assistant to keep all the secrets hidden. The legal assistant can also sense opportunities, often they have to point out vital points within a case that may turn the tide. Neatness in arranging documents and keeping a track of them is also vital when you want to become a reputed legal assistant. The goal of a legal assistant should be to climb up the grades in the legal profession. Seeking a position of Legal Assistant where I can utilize secretarial and legal skills in an environment beneficial for mutual growth and development in the legal sector. To bring my experience in documentation, research and other secretarial skills in the role of a Legal Assistant. To obtain the role of Legal Assistant bringing my understanding of legal terms and judicial systems for the well being of a reputed firm. Looking for the job of a Legal Assistant where skills in litigation, administration and creating affidavits will be utilized. 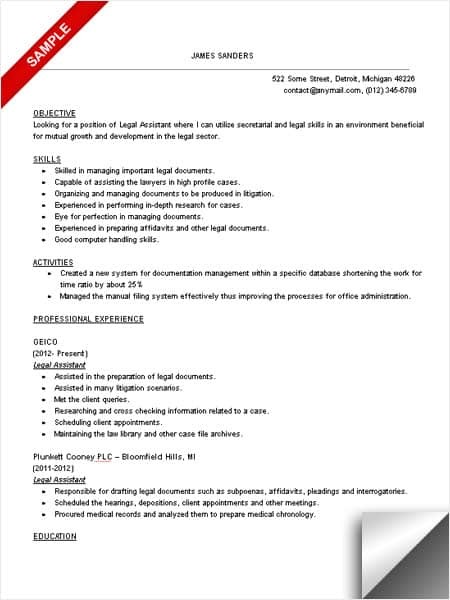 How to Write Legal Assistant Resume Skills? Skilled in managing important legal documents. Capable of assisting the lawyers in high profile cases. Organizing and managing documents to be produced in litigation. Experienced in performing in-depth research for cases. Eye for perfection in managing documents. Experienced in preparing affidavits and other legal documents. Mention your education qualifications that make you eligible for the job profile. Also showcase how you have helped your past employers with your skills. If there are some special skills that would give you an edge never fail to mention them. Looking for a position of Legal Assistant where I can utilize secretarial and legal skills in an environment beneficial for mutual growth and development in the legal sector. Managed the manual filing system effectively thus improving the processes for office administration. Assisted in the preparation of legal documents. Assisted in many litigation scenarios. Researching and cross checking information related to a case. Maintaining the law library and other case file archives. Responsible for drafting legal documents such as subpoenas, affidavits, pleadings and interrogatories. Scheduled the hearings, depositions, client appointments and other meetings. Procured medical records and analyzed them to prepare medical chronology. Bachelor’s in Paralegal Studies from University of Eastern Michigan. If you want to start a career in the legal field then legal assistant job is far better than court reporter . Be sure get a professional resume writing service to make you resume perfect and get an interview call very quick.